A Short Sale or a Foreclosure is most definitely not something anyone wishes upon them self or their loved ones. But, if you happen to be one of the many Americans who unfortunately experienced a Short Sale or Foreclosure, The Family Mortgage Team of Atlanta has good news for you! 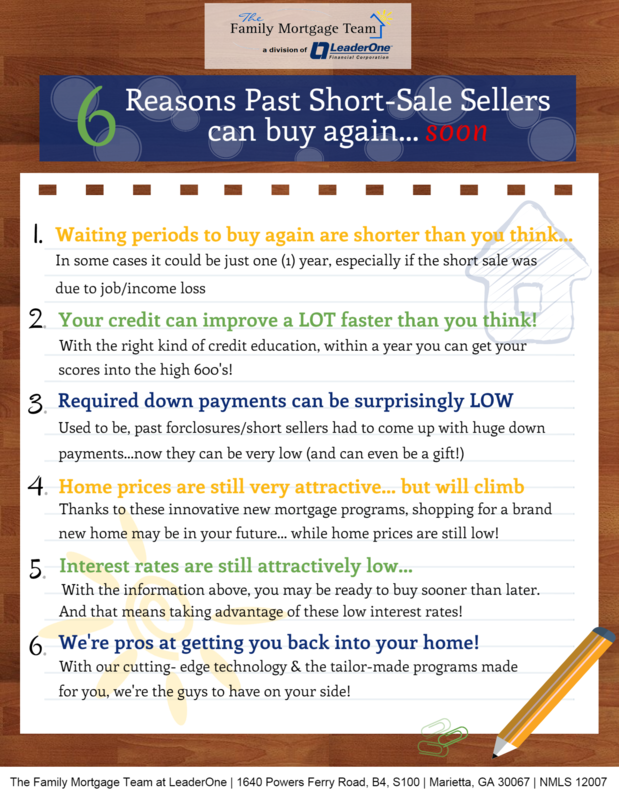 Listed below and in our infographic you’ll see Six Reasons Past Short Sale Sellers can (and should) Buy Again…soon. 1. Waiting periods to buy again after a Short Sale are shorter than you think. 2. Your credit can improve A LOT faster than you think! 6. The Family Mortgage Team of Atlanta are pros at getting you back in your home!